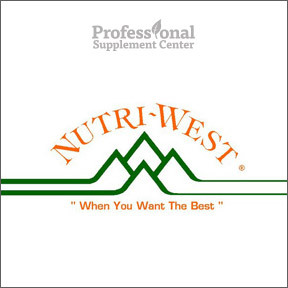 Founded in 1982 as a small nutritional supplement company offering a limited but effective line of products, Nutri-West has grown into a multi-national corporation, manufacturing and shipping over 280 products worldwide. Their sole focus is to provide ever more effective synergistic solutions that help healthcare professionals maximize their patients’ wellbeing. With a dedication to quality, purity and efficacy, Nutri-West offers high-potency, all natural nutritional formulas intended to deliver optimal wellness support. Nutri-West‘s well researched, high quality supplements, which include not only vitamins and minerals but also glandulars, specialty products, herbals and homeopathics, are available solely through licensed healthcare professionals. Located in Douglas, Wyoming, their proprietary formulations are carefully researched and developed, and extensive efforts are made to avoid common allergens. All raw materials undergo laboratory analysis to assure exacting standards are met. Additionally, their state-of-the-art production methods allow for the avoidance of preservatives and other chemicals. Their concern extends to the environment as well and substantive measures are taken to ensure that the clean water and fresh air of Wyoming remains unchanged. Packaging is kept to a minimum and is made of recycled materials. DSF Formula – Recommended during times of stress, this formula contains glandulars, vitamins, minerals, antioxidants and phytochemicals that work synergistically to support the body’s energy production systems. Glandulars are included to allow time for overstressed adrenals, thymus, spleen, and parotid glands to rest and recuperate. Our customers report increased energy and decreased stress levels when taking DSF Formula. Wheat, soy, yeast and dairy free. Total FLM – This 5 star rated formula includes standardized herbs and natural ingredients, such as boswellia, turmeric, glutathione, and quercetin, known for their anti-inflammatory effects. Our customers report reduced pain and inflammation with consistent use of Total FLM. Wheat, soy and dairy free, vegetarian formulation. Adreno Lyph Plus – This quality, highly concentrated formula offers a synergistic blend of vitamins, minerals, and amino acids plus adrenal, pituitary and parotid glandulars in support of the health and maintenance of overstressed adrenals. Rated 5 stars by our customers who report increased energy and effective relief while taking Adreno Lyph Plus. Wheat, soy and dairy free formula. Should you have any questions about these or any other formulas from Nutri-West, please call, visit or email Professional Supplement Center. This entry was posted in Home and tagged Adreno Lyph Plus, DSF Formula, Nutri-West, Professional Supplement Center, Total FLM, Vitamins and supplements, www.professionalsupplementcenter.com. Bookmark the permalink.